Nestled in the heart of Nashua*s high tech district the Hampton Inn Nashua offers all that both business and leisure traveler*s desire. 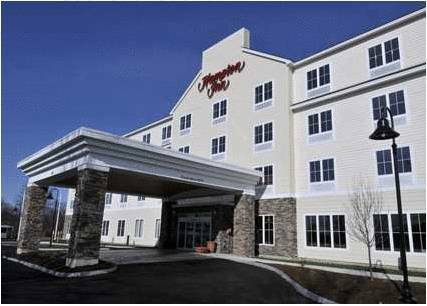 The Hampton Inn Nashua is conveniently located close to major area businesses BAE Systems Fidelity Investments Lockheed Martin Skillsoft EMC and Oracle. Take advantage of tax-free shopping at Pheasant Lane Mall Skiing Golf Canobie Lake Park and all that the Merrimack Valley has to offer. Start your day off with our complimentary On the House hot breakfast or if in a rush stop by the front desk and grab one of our On the Run Breakfast Bags weekday. Your time is well spent at the Hampton Inn Nashua where you can also take advantage of our complimentary high-speed internet access and get a good night rest on our signature Cloud Nine bedding. All 102 rooms are completely non-smoking and include in-room coffee maker large LCD flat screen and a large work desk. While a guest at the Hampton Inn Nashua one thing is for certain - we love having you here. All reservations must be cancelled 24 hours to host time unless deposit is required. If this reservation has been made electronically please cancel it electronically to avoid confusion and a no show bill. Policy subject to change.